Background: Captured near Iceland in 1978 at the age of two, Katina is arguably SeaWorld's most valuable killer whale. Not only has she provided matriarchal leadership and stability at the Orlando park for decades, she's trained dozens of young trainers and has been a prolific mother. In SeaWorld terms, she has produced many "assets" over the years, and has doubled the typical lifespan of a captive at SeaWorld. "KAT" is known as The Cadillac to those who've worked with her due to her steady personality & ability to consistently deliver "hot dog" segments for crowds at Shamu Stadium. Waterwork was banished at SeaWorld, per Judge Ken Welsch's ruling, here, after the tragic death of Dawn Brancheau in 2010. Note the (lesser) degree of dorsal fin collapse from 1995. A top mom, KAT was the first female killer whale to successfully give birth in captivity; in part due to larger pool sizes constructed in the mid 1980's. These bigger pools gave calves enough room to nurse. KAT's first "Baby Shamu" was Kalina, half Icelandic and half Southern Resident, like her father, Winston. Katina is also known for having a son, Taku, whom would later impregnate her, producing the inbred whale, Nalani, who was born 9/18/2006. For this, Taku was shipped to Texas, where he would die a year later from neuroinvasive West Nile Virus transmitted by a mosquito. As you can see, Katina has had a tragic life at SeaWorld over the past 40 years, outliving 3 of her offspring Taku, Kalina & Unna, where her circular swimming pattern and time at the surface have both contributed to her collapsed dorsal fin. That fin, now badly damaged, may have to be partially amputated, depending on how much blood flow can be preserved above the lesion. We will be looking for evidence of tissue necrosis over the next several weeks. 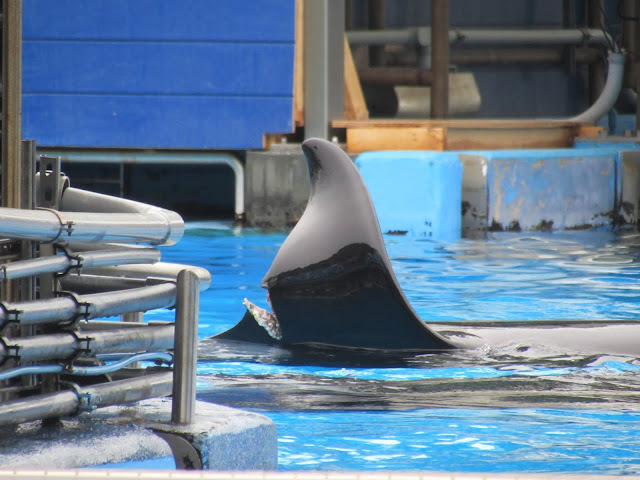 What can we determine from SeaWorld's Public Relations Response? With the recent change in leadership, from former CEO Joel Manby, to current CEO John Reilly, we now know that the misinformation campaign at SeaWorld will continue. Reilly, a long time insider, seems to be turning back the hands of time. This translates into less transparency & more misinformation. As pointed out already, the company has been hiding this injury from the public for two full weeks; only fessing up after Healther Murphy published her own photographs. SeaWorld's actual response to this injury, here, is both vague and delusional. This injury is a DIRECT CONSEQUENCE of captivity itself, for two reasons. 1) In the open ocean whales that are being chased or displaced can simply get out of the way 2) It was the concrete & steel enclosure at Shamu Stadium that caused the laceration itself, whether it was bars on a gate or her impacting the glass, as former trainer John Hargrove has postulated. Seaworld has elected to ignore reality entirely, hoping no one notices.